Join us on the Lolo National Forest this year as we rebuild and beautify a gem from Forest Service and early fire-fighting history at the Historic Ninemile Remount Depot! PIT volunteers will work with Forest Service preservation professionals installing a wood-shingle roof on the Depot’s Fire Engine Bay. The FS established the Remount Depot in 1930 to train mules and packers to haul supplies to firefighters in the backcountry of the National Forests of the Northern Rockies, and was in regular use this way until 1954. Ninemile was also the first home of the FS Smokejumpers in 1940 and ’41! 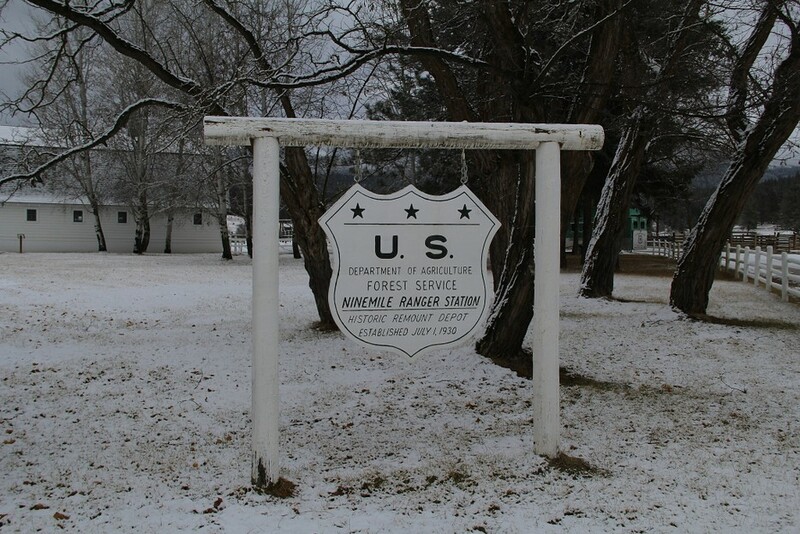 The Ninemile Remount Depot is listed on the National Register of Historic Places (NRHP) and, today, serves as the Ninemile Ranger Station of the Lolo NF and the Ninemile Wildlands Training Center. The Ninemile Wildlands Training Center teaches courses to FS employees as well as the public in backcountry skills such as horse and mule packing, Dutch oven cooking, Cross Cut saw use and historic preservation. During the course of this project, PIT volunteers will learn the correct application of wood shingles and learn the techniques for grading cedar shakes and shingles. Volunteers will also learn the principles and philosophies of historic preservation. The specialists on the Northern Region Historic Preservation team will teach this formal hands-on training in wood shingle and wood shake roof replacement for historic and modern buildings. Volunteers will learn skills in material selection, ground staging (scaffolding), roof staging (toe boards), use of specialty roofing tools, the process of old roof removal, and technique applications for installing a new roof. These applications consist of the proper shingle exposure, single and double coursing, stack joints, fasteners and flashing. We welcome both the experienced and the novice volunteer – both will come away with new skills, new historical knowledge, and an experience like none other! We hope to see you this summer! Special skills: Previous carpentry, shingling, roofing, and/or historic preservation skills helpful, but not required. However, please note: we will be spending the majority of the week on the roof – those afraid of heights might want to look elsewhere for PIT opportunities! Facilities: Camping facilities provided near work site at no charge; volunteers must provide own sleeping bag and other personal camping equipment, extra water, and initial transportation; small trailers or motor homes OK, no hook-ups available; wall tents and cots will be provided if necessary. All meals will be provided on site – showers too!